Submitted by kathyf on June 5, 2015 – 2:05pm. 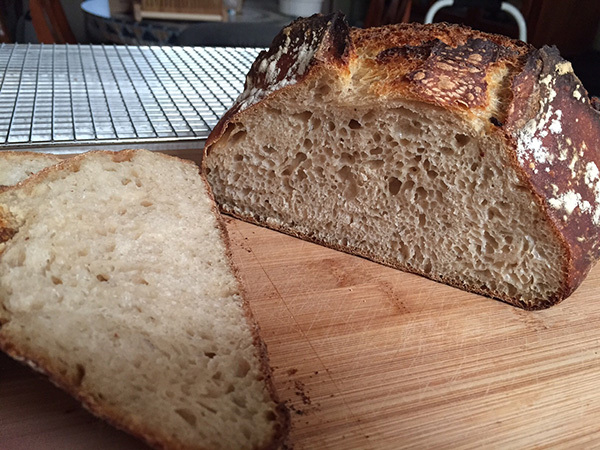 Having recently purchased Flour Water Salt Yeast by Ken Forkish, it seemed appropriate that I try out a recipe! I decided to try the Overnight Country Blonde. I studied the recipe, watched Ken’s videos on Youtube and read back any posts I could find here on TFL (and there were quite a few!). First off, I didn’t use his method for building the starter. 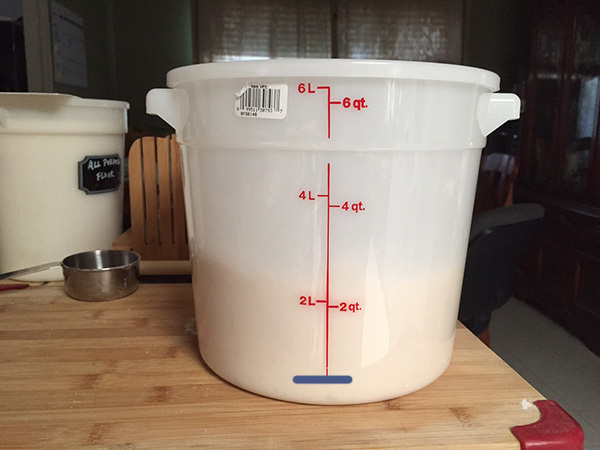 I just built up my starter to the amount needed for the recipe. That worked well, though of course I have no idea if it makes a difference in the flavor. The blue line shows about where the dough was when I went to bed. It passed the 2 liter mark and was just starting to fall. A tad over-proofed. The dough was quite slack but not totally unworkable. I was able to do the letter folds but had a heck of a time getting good tension when forming the boule. Can’t say I totally succeeded with that. All in all, I think it turned out pretty good. I think it lacks big holes because I worked a little too hard to shape it. But the texture is good and the crust is thin and crispy. And the flavor is great. I want to try it again, but have to think about how I am going to control the bulk rise. « Big air pocket in my sourdough loaf.